Few Beethoven cycles have gotten off to such a promising start as that of Osmo Vänskä conducting the Minnesota Orchestra. 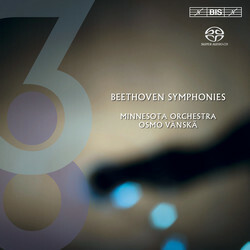 Since its release last year, BIS-SACD-1416: Symphonies No. 4 and 5 has garnered distinctions and top marks all over the world. Making the disc its Editor’s Choice, The Gramophone described it as ‘fiery, elegant, bristling with character’ adding ‘This is impressive Beethoven’, while the critic in Financial Times called it ‘the modern Beethoven recording par excellence’ and the reviewer in Le Monde de la Musique favourably compared Vänskä’s ‘incisive examination’ of the scores with the interpretations of ‘Norrington, Hogwood, Brüggen, Harnoncourt, Gardiner and Rattle’. The quality of the recording as well as the sound reproduction also received much praise and was described as being ‘state-of-the-art’ and ‘of demonstration quality’. The eagerly awaited second instalment is now ready for release, and will most certainly create just as much excitement. The orchestra and Vänskä – who recently extended his tenure with the Minnesota Orchestra until 2011 – have, if possible, become even more attuned to each other, and together create a performance of the Eroica Symphony which is as close as possible to perfection in the details without ever losing sight of the longer lines – or the drama of the Funeral March! Symphony No. 8 provides a lighter relief, as well as ample opportunity for the Minnesota strings to shine in the notorious fast Finale. All in all an intense musical experience, leading up to Symphony No. 9, recorded in January 2006 and planned for release in the autumn.